Joy Wing Mau has acquired a minority share interest in Yunnan-based Shennong Variety Management (SVM), paving the way for the partners to commercialise new varieties in China. SVM has been introducing new fruit and berry varieties into China since 2007, working with domestic and international IP owners. Based in Kunming City, Yunnan Province, and run by New Zealand owners, the company is headed up in China by experienced horticulturalist Lew Dagger. SVM, which is the Chinese member for the Associated International Group of Nurseries (AIGN), is also now helping Chinese breeding programmes to monetise their varieties in the rest of the world. “SVM is really excited about Joy Wing Mau’s involvement with SVM,” said SVM chairman Rex Graham in a company statement. “Joy Wing Mau is one of the largest produce distributors in China, and we see huge new opportunities in China for all of SVM’s proprietary fruit and berry varieties. Joy Wing Mau chairman Liu Mau Wah said its link-up with SVM and AIGN was key to the group's strategy of delivering high-quality fruit to its customers. 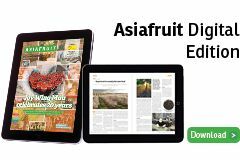 SVM’s John Morton told Asiafruit that much of the company’s work over the past ten years had focused on bringing IP material into China through quarantine, and testing it in local conditions to gauge the most suitable varietal selections for production. Having completed these processes, the company is ready to commercialise several varieties, he said, noting that it needed a Chinese strategic partner of Joy Wing Mau’s calibre to succeed in that process. “We have several apple and pear varieties that we’re keen to get into production now – we know they work in local conditions, we’re ready to commercialise them and we’re confident of their potential,” he said. With its vertically integrated structure and substantial distribution network, he noted that Joy Wing Mau is a group with the capacity to provide control of IP, from nursery production through growing to sales and marketing. While discussions for the strategic alliance between the two companies started more than a year ago, Morton said their relationship – via Lew Dagger and Liu Mau Wah – goes back many years. He added that Joy Wing Mau’s New Zealand connections also attracted SVM to partner with the company. 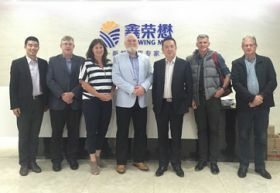 As well as being a distributor for Zespri in China, Joy Wing Mau purchased a 19.9 per cent stake in New Zealand-based T&G Global last July, and many New Zealand exporters market fruit through the group’s channels.